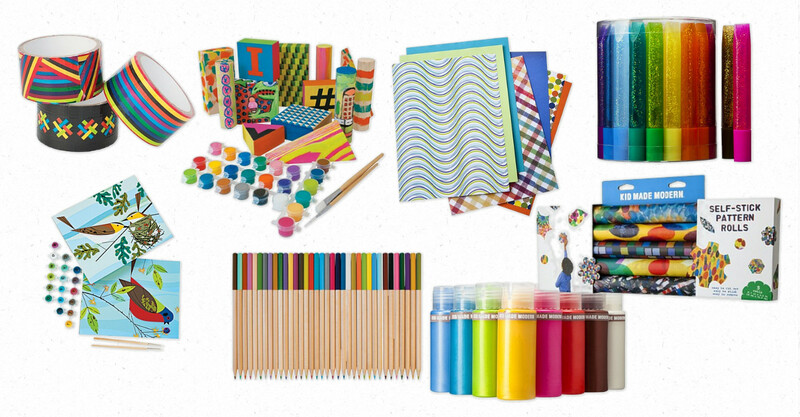 This round-up post is all about a new line of kids arts and crafts supplies by Todd Oldham for Target called Kid Made Modern. Anyone who loves creating things will like this stuff, whether you are a kid or not. All the bright colors, beautiful packaging, and non-traditional craft supplies such as brightly patterned duct tape and self-stick pattern rolls are what really caught my eye. The whole line is an impulse purchase waiting to happen. I don’t really need any of this and it is a little on the pricier side of what I’d like to pay. However, I still couldn’t resist splurging on a set of the duct tape, although I have no idea what I’ll use it for (i.e., total impulse buy!). Anyone have any good duct tape craft ideas? Gorgeous set of colored pencils – who wouldn’t want these displayed in a pencil cup on a desk? Click here to get all the details on each and be sure to check them out the next time you are at Target.